Arabs in Israel and around the world commemorated the 33rd Land Day on Monday. The main event was held in Deir Hanna in northern Israel, and included Arab MKs, political activists and thousands of demonstrators. Land Day is an annual day of commemoration in the Israeli Arab community and in Arab communities worldwide, meant to protest the 1976 killing of six Arab citizens during an Israeli government's bid to confiscate Arab lands. It is usually marked by general strikes and mass marches. Leaders from the Arab public who participated in the event said Arabs should be concerned with the political right's entrance to the center of the Israeli arena. Thousands of residents embarked on a procession Monday afternoon passing through the communities of Arab Arraba and Sakhnin and ending in Deir Hanna. The demonstrators carried PLO flags, and the slogan for this year's Land Day was: "We are all united under Israeli fascism and racism." Hadash MK Afou Agbaria told Ynet during the march that "the reasons that led to Land Day are still relevant and valid today – the confiscation of lands continues". United Arab List – Ta'al leaders also said this day of protest was no less important this year, in light of recent events. MK Talab El-Sana commented on February's general elections for Knesset and the formation of the new government and said that "Land Day is especially important this year due to the extreme Right's rise to power and a rise in trends of Judaizing the Galilee and the Negev by marginalizing the Arab public". El-Sana called on the government led by Likud Chairman Benjamin Netanyahu "to put a stop to the racist plans of Judaizing the Galilee and Negev and adopt development policies for all the Galilee and Negev's residents". Faten Hussein, a resident of Deir Hanna who was present at the rally, said, "It is important for me to come here each year with the kids so they know that they are Arabs who live in the State of Israel with Jews and that their roots are Arab." Manaa Hussein, of Majdal Krum, who also came to the rally with his children, expressed similar sentiments: "The children must know the history of our people. The children must be taught what happened since the establishment of the State up to this day. "It is also important to me that my children understand that we have to live in peace, coexistence and equality." "This year Land Day expresses even more the outcry against racism and the toxic spews of Netanyahu's government," said Hadash Chairman Muhammad Barakeh, "We are concerned with the atmosphere brewing in Israel, but we are not afraid." MK Masud Ganaim (United Arab List – Ta'al) expressed a similar position: "The election results indicate that the Jewish population is radicalizing to the right, and all the loyalty tests they want to put us through in the future will only increase suspiciousness." The Balad party announced it would file a bill proposal to the Knesset aimed at recognizing Land Day as a national holiday for the Arab public. "The next step will be to file another bill proposal demanding we get back the lands that were taken away from us. This is a law that exists in all civilized countries in the world and Israel is at the top of the list of land confiscation laws," said Balad Chairman Jamal Zahalka. On the 33rd Land Day in Israel, the West Bank and around the world, cries against Israel's policies towards the Palestinians were heard. At a local rally held in the northern community of Kfar Kanna two youths were arrested under suspicion of throwing stones at police officers. The main rally in Deir Hanna will be echoed by mass gatherings in the US, Canada. Germany, Finland, France and Belgium. Meanwhile, the World Social Forum (WSF) – an umbrella group for hundreds of social, anti-globalization and rights groups worldwide – announced it would be launching a campaign calling on all of its affiliates to excommunicate Israel. 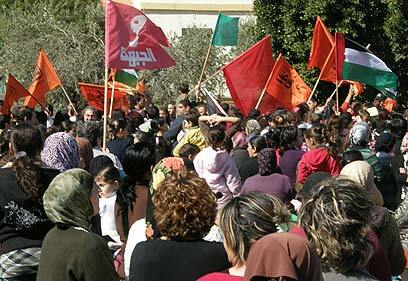 Also on Land Day, some 120 Palestinians demonstrated near the security fence in the village of Naalin, near Ramallah. The protestors threw stones at security forces in the area, who responded with crowd dispersal means. No injuries were reported. Near the security fence in Jiyus, near Qalqilya, some 40 Palestinians clashed with soldiers and threw stones at them. In addition, in Adna, which is near Hebron, some 60 Palestinians clashed with security forces. See all talkbacks "Arab leaders on Land Day: We're not afraid of Right"